Markets.com, an online forex and CFD broker is a very popular forex broker among traders. Besides the catchy brand name, Markets.com is a serious forex broker that has been in operation since early 2000. Being one of the early leaders in the retail forex space, Markets.com has evolved to become one of the well known and reputable forex brokerages with over 17 years of successfully running the forex brokerage. The parent company, Safecap Ltd. was acquired by Playtech Ltd, which is a publicly traded company that is listed on the London Stock Exchange (LON: PTEC). While this might be limiting for readers from the above regions, for traders from the rest of the world, Markets.com offers an exciting range of instruments to trade. Markets.com offers a standard account type for traders. Meaning that, there are no complicated account types to choose from. The minimum amount required to open an account with Markets.com is only $100. While Markets.com offers Standard and Premium account types, the additional value added benefit is in terms of market reports and dedicated account manager. Traders who register for a demo account can claim a $25 no deposit bonus if they fill out the account details such as name/email address and other trading related information. In terms of spreads and trade execution, Markets.com offers floating or variable spreads as well as fixed spreads, depending on the instrument that you are trading. For example, most of the forex currency pairs come with a fixed spread. For EURUSD, the spread is 3 pips, which admittedly can be a bit large for some traders. But for the wide choice of trading instruments which covers stocks and bonds besides indices, forex and metals, the spread is a small price to pay. The table below summarizes Markets.com trading account conditions. Spreads: Markets.com offers floating and fixed spreads depending on the instrument in question. For the major forex currency pairs, the average spread ranges from 2.2 pips to 3.10 pips. Some of the cross currencies such as AUDNZD, EURNZD have spreads in the range of 10 15 pips, while exotic currencies such as EURSEK, EURRON and so on have spreads in the range of 40 – 60 pips. Due to the fixed spread, the spread changes are largely constant. Execution: While markets.com offers market execution, pending orders can be set an average of 5 – 10 pips from the market price. Instruments: Markets.com is unique in the fact that traders have a wide choice of trading instruments to choose from. In all honesty, while markets.com is not ideal for trading forex, if you prefer to trade bonds, stocks, commodities, indices and shares, then Markets.com is the ideal broker to trade with. Markets.com offers demo trading platform on both the MT4 webtrader as well as the desktop application. The demo trading account is unlimited and comes with 10,000 USD or EUR and a leverage that can be set to 1:100 or 1:200. The demo trading account reflects the real trading conditions and gives you access to all the trading instruments. Click here to open your demo account for free! For traders, Markets.com is ideal if you want to trade stocks, futures or bonds and indices. Due to the wider reach of the instruments, this makes is easier for traders to use a variety of instruments to trade with Renko charts. The chart below shows the 10-year US Treasury note applied with the 0.10 point fixed Renko chart. You can also apply the Renko chart to other instruments. The next chart below shows the Renko chart for the VIXX or the Volatility Index. And another example being that of Soybeans that is available to trade from Markets.com. Almost all of the trading instruments (especially stocks, bonds, futures) come with good history, which is essential when building offline Renko charts. For traders who prefer to trade something beyond the usual currencies or precious metals will find Markets.com product offerings to be ideal. In conclusion, the relative testing of Markets.com trading conditions especially on stocks, commodities, bonds, indices shows that the trading conditions are fairly acceptable. 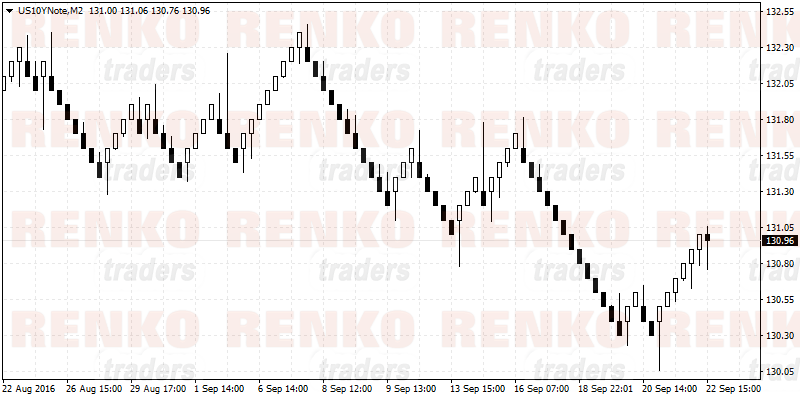 With the wide choice of trading instruments, traders can experiment with the different markets using offline Renko charts. What to expect from Oil this week as OPEC members meet?